Every horse(wo)man knows that feel and timing are crucial when training horses. But how can you explain "feel" and what exactly is timing? And more important: how can you develop better feel and timing? In this third episode of the Horsefulness Training Podcast, Karine Vandenborre answers these questions for you! During her work with horses and students Karine Vandenborre -Founder of Horsefulness Training- identified 5 main causes why horses lose their joy and become fearful, stressed or resistant during training.If you are experiencing training problems with your horse at the moment, or you want to prevent having problems, for sure this episode will be valuable to you! 5 main causes why horses lose their joy and become fearful, stressed or resistant during training. Every horse(wo)man knows that feel and timing are crucial when training horses. But how can you explain "feel" and what exactly is timing? And more important: how can you develop better feel and timing?In this third episode of the Horsefulness Training Podcast, Karine Vandenborre answers these questions for you!She also tunes in on:the different levels of communicationthe importance of opening up to your horsethe #1 reason you lose your natural feelsoftness of body and mind, and how you can achieve thatand more! In this second episode of the Horsefulness Training Podcast Karine Vandenborre explains what Groundwork according to the Horsefulness phylosophy is, why you should do Groundwork and she answers 5 questions that were sent in by mail.Q 1: My horse is pretty anxious about tractors and big vehicles. She is also very spooky when we pass bushes and branches. Then she disconnects and only wants one thing: run off! How can I keep the connection when she is so afraid?Q 2: My horse is afraid to back up out of the trailer. Any advice on how to train him to back up instead of turning in the trailer to unload?Q 3: If Liberty is the foundation and you can do everything in Liberty, why do you go to Groundwork? Can’t we do everything in Liberty? What is the benefit of doing Groundwork?Q 4: I had to use a lot of direct pressure from my instructor to teach my horse to yield. This didn't feel right. Is it really necessary to teach your horse to yield for direct pressure?Q 5: The Groundwork I've been doing became to easy for my horse and therefore she loses interest. I would like to get some tips on how to make Groundwork more difficult and stimulating for her and me.When answering these 5 questions, Karine talks aboutaccepting fearfocussing on your breath to stay presentusing the "liberty-principle" when doing groundworkcommunication versus force when yielding to physical aidsShe also tunes in on how to prepare your horse in a step by step manner for trafficwhy negative reinforcement is not "negative", like some people thinkwhat a groundwork sequence is,and much more!The blog-post about yielding for physical aids that she refers to in this episode is this one. In this first episode Karine Vandenborre explains what Liberty Training according to the Horsefulness phylosophy is and she answers 5 questions that were sent in by mail.Q 1: My horse ignores me, what can I do?Q 2: My horse is stubborn and impatient, he bites and kicks, pulls loose on the lunge. Any advice?Q 3: I noticed that you do involve children during Liberty Training, any advice for doing the Horsefulness Liberty Training Program with young people?Q 4: I can't approach/catch my severely abused mare. How can I solve this?Q 5: You write that during liberty training the horse has the freedom to do whatever it wants to do. But in my opinion a horse needs rules, especially in liberty. 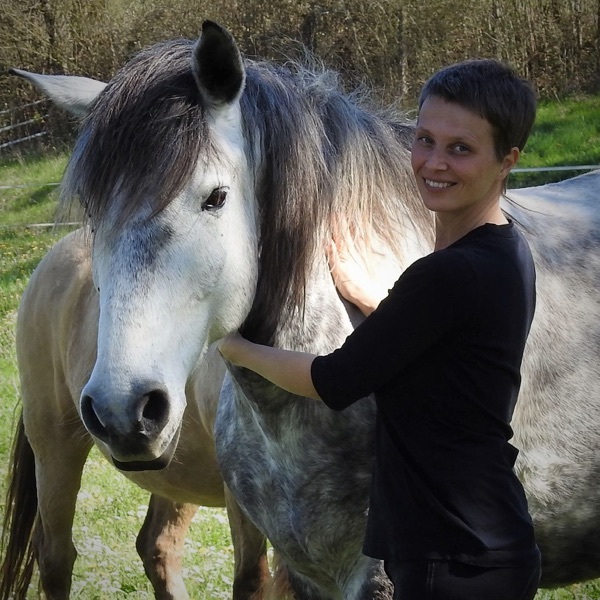 Don’t you have rules about what the horse is allowed and what it is not allowed when you work at liberty?When answering those 5 questions, Karine talks about being present, how to connect with yourself and your horse through your breath, mindfulness and children. I also tune in on how to get your horse more curious and engaged, tension in the horse, vitamine N, why abused horse have an extremely sensitive attena for tension in the human, and much more.